Tripp Lite's OmniSmart 500 PNP UPS System provides intelligent, line-interactive battery backup for personal computers, network workstations and small servers. 500 VA of battery backup allows you to work through short blackouts or safely shut down during longer ones. 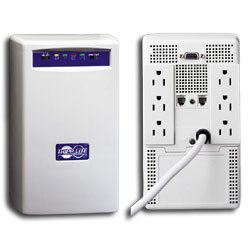 The unit has 6 outlets, diagnostic LEDs and a built-in serial port that works with PowerAlert Software to provide automatic unattended shutdown. Network workstations, small-business servers, CAD/CAM/CAE workstations, mid-size & large business telephone/voicemail systems, hubs, routers, personal computers and more.